One Blackfeet tribal elder is hoping to make saving the Badger-Two Medicine Region along the Rocky Mountain Front his primary mission before dying. 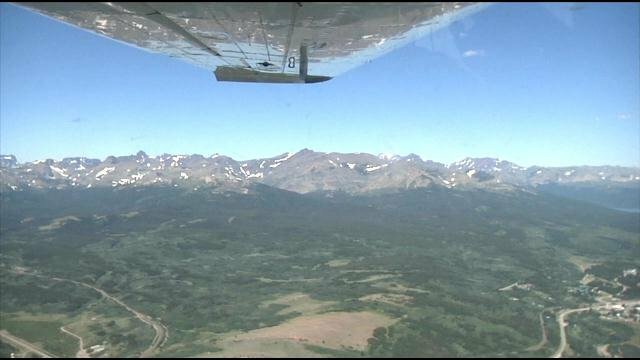 ABC Fox Montana's Angela Marshall took an Eco-Flight over the area to see first-hand the legacy-of-land that Chief Earl Old Person wants to leave for future generations. The Badger-Two Medicine region encompasses more than 165,000 acres of land. It's an area of land the Blackfeet Nation has utilized for more than 10,000. Now, two big names, U.S. Senator Jon Tester and Pearl Jam's Jeff Ament, are helping Chief Old Person preserve the integrity of the property. "We're gonna have to fight like hell to make sure this doesn't become an oil pumping station," says U.S. Senator Jon Tester. Not only does Chief Old Person say that the land sacred, but it serves at the connective tissue between for the Blackfeet Indian Reservation, Glacier National Park, and the Bob Marshall Wilderness Complex. It is still home to all of the same wildlife species that inhabited the lands when Lewis and Clark discovered it in the 1800's, except for the bison. There has been a tug-of-war over it after the Bureau of Land Management in 1982 began issuing oil and gas leases without consulting the Blackfeet Tribe. "I consider this one of the 'Last Best Places' to be, and our people regarded our areas to be vary sacred. Especially the mountain areas, the wooded areas." Along with enlisting the help of Senator Tester and Jeff Ament to launch a media and legal campaignto help in the cause, Chief Earl Old Person recently wrote a letter to President Obama to work together to put an end to the oil and gas leases.